The Penguins got great production from their star players throughout the series, and it was the biggest names leading the way. Sidney Crosby led the team with 8 points (3g, 5a) in the series, while Evgeni Malkin posted the higher points per game average as he contributed 7 points (2g, 5a) in the final four games. Phil Kessel had a dominant series, positing 3 goals and 3 assists with some great passing to set up Pittsburgh goals. Patric Hornqvist had a Game 1 hat trick en route to 3 goals and 2 assists, and while Kris Letang was a bit quieter in the series, he still managed 5 points (1g, 4a) while averaging a team high 27:17 per game. If the stars led the way, then it was the role players who followed their lead. 16 Pittsburgh skaters found the stat sheet in the series, and their depth was a big part of beating New York in 5 games. Conor Sheary (2g, 1a) might be playing himself into a full time spot in the top 6, as his speed and nifty puck skills made him a player the Rangers had to focus on when he stepped on the ice. Matt Cullen (2g, 1a) continues to be a force on the bottom line after a strong regular season, and Bryan Rust (2g, 1a) returned from injury to be one of the key offensive drivers in Game 5's rout. Matt Murray was phenomenal in his three starts, posting a 0.955 SV% and 1.33 GAA and alleviating any concerns about the Pens' net moving forward. The Rangers were a flawed team entering the postseason, and not even Henrik Lundqvist could patch all the holes. New York was just 20th in the league with a 48.2 SACF% during the regular season while also topping the league with a 102.3 PDO at even strength, suggesting they received more than their fair share of luck throughout the regular season. The Eric Staal trade added a struggling player to a struggling bottom 6, and the team's defensemen have taken a step back from where they were when the team played for the Stanley Cup. 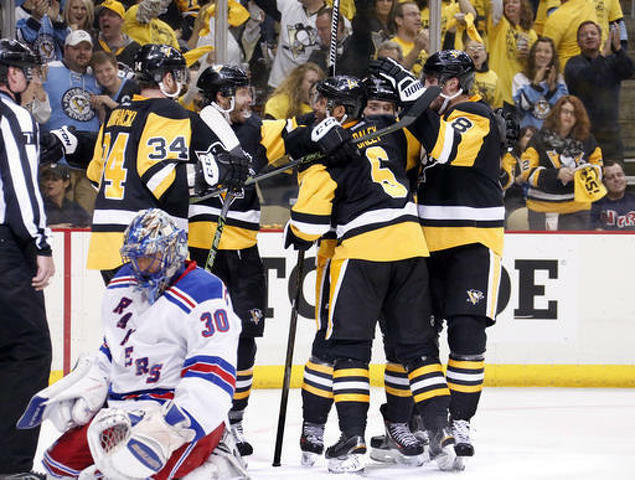 It was the Rangers, not the Penguins, who were the top heavy team ripe to have their lack of depth exploited, and while Lundqvist threatened to steal a win New York didn't deserve in Game 3, he ultimately couldn't, and Pittsburgh would chase him from the net in both Games 4 and 5 to end the series. While the Pens were 5th in the league at 84.4% on the penalty kill, their power play was hot and cold throughout the year, leaving them 16th in the league at 18.4% with the man advantage. New York wasn't good either up a man or down one, as they were 14th on the power play (18.6%) and just 26th on the penalty kill (78.2%). Pittsburgh didn't have much difficulty shutting down a mediocre Rangers power play, finishing the series 17-for-19 (89.5%) when down a man, but the return of Evgeni Malkin helped the Pens jump start a power play that had faltered down the stretch. The Penguins went 8-for-21 (38.1%) with the man advantage, scoring timely goals that further put a bad Rangers team into a hole at even strength.